I enjoy reading and writing poetry. I am silly and intense. I am passionate and emotional. I can get angry and have always had a temper. Sometimes my thoughts will not quit and are more than I can handle. I can be dark, depressed, anxious, self-loathing, negative and hopeful. I hold grudges longer than I should. I am the founder of a new non-profit that is trying to make its way with a mission to provide opportunities for people to change the world and themselves through service. The “false self’ of the Pharisee in this story is on full display. He is a person Jesus refers to as one who is convinced of his own righteous and despises others. In the parable, the Pharisee takes up “his position” and then offers a prayer of arrogant piety. His worth and value is based on viewing himself as better than the rest of humanity. He is so disgusted by false selves of others he has lost any awareness of his own. In contrast stands the tax collector who prays from his true self and asks: “O God be merciful to me a sinner.” It is by stripping away the external façade that the tax collector realizes his true self. He knows that nothing on the outside matters. When all is stripped away, and he owns his need for mercy, he is exalted. On our own we are nothing and yet because God has chosen us we become everything. What external façade or elements of a false self, do you adopt to protect yourself? How would you describe your true self? FAST: Put aside the façade that protects you from knowing and revealing your authentic identity. PRAY: O God Be Merciful to Me A Sinner. GIVE: attention to someone who is struggling emotionally, physically or spiritually. Joe Nettesheim is the Founder and Director of 12plus1. He has been involved in Church ministry since 1991. Besides 12plus1 he also teaches at Dominican High School and Cardinal Stritch University St. Clare Center for Catholic Life. Joe is an avid fan of U2, Green Bay Packers, Milwaukee Bucks, Brewers and Marquette University basketball. He is married to Maribeth. Their blended family consists of 5 children, 2 sons-in-law, 6 grandchildren and TS Eliot, the golden doodle puppy. One of the scribes came to Jesus and asked him, “Which is the first of all the commandments?” Jesus replied, “The first is this: Hear, O Israel! The Lord our God is Lord alone! You shall love the Lord your God with all your heart, with all your soul, with all your mind, and with all your strength. The second is this: You shall love your neighbor as yourself. There is no other commandment greater than these.” The scribe said to him, “Well said, teacher. You are right in saying, He is One and there is no other than he. And to love him with all your heart, with all your understanding, with all your strength, and to love your neighbor as yourself is worth more than all burnt offerings and sacrifices.” And when Jesus saw that he answered with understanding, he said to him, “You are not far from the Kingdom of God.” And no one dared to ask him any more questions. A youth minister was not a vocation I saw myself in when I was younger, however, as I grow in my new role I find it more rewarding than I ever could have imagined. I find the teens I work with to be so profound, whether they know it or not. This fall, I was reflecting with my 9th graders on a similar passage found in Matthew and they asked me: “If these two commandments are the greatest—why do we need the other 8?” A seemingly simple question, but it caused me to pause and think. I stumbled, but eventually came to tell them that the other 8 commandments stem from these two and that they are specific ways in which we are to live out the greatest commandments. This moment prompted me to stop and consider just how great these commandments are, and what they entail. Loving the Lord above all things—this is something we have heard a million times but there’s more to it than meets the eye. Sometimes, every day practices interfere with us loving the Lord to the best of our ability, such as: toxic relationships, gossip, bad habits/old routines, our work, and even ourselves sometimes! Lent is a great time to put these things that keep us from God aside and form new habits that lead us closer to Him. Loving our neighbor. This commandment is one that I try to live my life by. Growing up, it was instilled in my sister and I that we are called to love everyone, no matter the color of their skin, socio-economic status, sexual orientation, political affiliation, how many commandments they have broken, etc. This is something I learned first-hand in graduate school—living in San Diego for two years. I encountered people coming to this country—seeking a better life for themselves and their families—who had absolutely nothing. We are called to see the face of Christ in these and all people. Christ welcomed the sinner, cleansed the leper, and gave hope to the hopeless. We are called to love our neighbor by walking in His footsteps and encouraging others to follow suit. I encourage you to pick up a new practice this Lent and see the face of Christ in all you encounter. What old practices/habits are keeping me from loving God? What can I do to leave these behind this Lent and open myself up to God’s loving embrace? How will seeing the face of Christ in others affect the way I relate/think about others? How can the Lord help me to see His face in those that are particularly challenging? PRAY for the ability to see Christ in others. FAST from habits that lead you away from Christ. GIVE kindness and peace to all you encounter. Good and Gracious God, thank you for all of the wonderful blessings you have bestowed upon us. Help us to live your commandments. Help us to see your face in all that we encounter and serve, especially for those where it is particularly challenging. Grant us your peace as we go forward in your footsteps. Hannah Bergland is the Director of Youth and Young Adult Ministry at St. Boniface Parish in Germantown. She is a graduate of Cardinal Stritch University and the Franciscan School of Theology in Oceanside, California. Some time ago there was a family with whom I would be invited to their Sunday dinners. The family was gregarious and very loud. Often, they would talk over one another. When one member felt they were not being heard they spoke louder. It became a cycle of loudness as they sought a validation that would never come. Inevitably an argument would ensue as all parties involved felt misunderstood. It is impossible to be understood if no one hears you. Next time they would just speak louder, and the cycle continued. This family is a microcosm of society. I-message, WhatsApp, Facebook, Instagram, Twitter, Snapchat, Marco Polo, 24 hour a day news channels, binge watching Netflix, Hulu, Amazon, HBOGO, podcasts, Spotify, YouTube, etc., etc., etc. The noise and stimulation are constant. Some people even listen to music or Netflix while they sleep. There are more ways to communicate than ever, but much like the family with whom I had dinner, no one seems to be listening. Social media has made everyone the expert. There is no need to listen to anyone else. We have all the answers and a vehicle to share them. It is as if we are at dinner and the noise level goes up as we try to make sure that we are heard. One casualty of this current culture is that we don’t even listen to ourselves. Parker Palmer wrote a book titled: Let Your Life Speak. In this book he writes, “Before I can tell my life what I want to do with it I must listen to my life telling me who I am.” Listening is a skill and it demands quiet. Constant stimulation, busyness and the pressure to put forth a certain image prevents us from hearing what our own lives tell us. Grasping for likes and shares – grasping for approval and acceptance- can prevent us from living authentically. Hearing God’s voice requires stillness. It will take a conscious effort to break the cycle of loudness and busyness. Sometime ago there was a movement to give God 1% of your day. This 1% translates to 15 minutes. What if you set aside 15 minutes to read the daily reading, tell God about each person you met during the day or to write in a prayer journal? Maybe your quiet time could be on the elliptical or when you are out for a run. Aldous Huxley suggests that God cannot be known without silence. If we take 1% of our day to listen to God, it will become abundantly clear that God has claimed us as his own and we will prosper! How much time do you find for quiet reflection or prayer to listen to God? What strategies might you use to make time for prayer? How is your life telling you about who you are? FAST from social media for one day. PRAY by sitting in silence with God. Just listen. GIVE your attention to someone who needs it today. Joe Nettesheim is the founder and director of 12plus1. He has been involved in Church ministry since 1991. Besides 12plus1 he also teaches part time for Dominican High School and the Cardinal Stritch University Claire Center for Catholic Life. He is married to Maribeth. Their blended family consists of 5 children, 2 sons-in-law, 6 grandchildren and TS Eliot, the golden doodle puppy. I wish I could say I had read this verse prior to beginning my Lenten journey, as I believe it accurately embodies my Lenten mantra: to be the best version of myself. While I admire the array of sacrificial offerings I see my family, friends, and co-workers making these 40 days, I finally admitted to myself that giving up something, or to be more relevant with today’s Gospel, abolishing something, was not helping me grow closer to God or deeper in my faith. All I could focus on was how I wanted whatever it was that I could not have and come Easter day I knew I would allow myself to binge on just that -- candy, Netflix, social media, you name it. What instead has helped me spiritually connect Lent with my everyday life has been adding something in or fulfilling if you will. A friend of mine from what I term my “volunteer year” often would question what the best version of herself would look like. When making decisions she would ask herself, “What would the best version of me do in this moment?” Soon we will journey with Jesus through Holy Thursday and His agony in the garden, wrestling with God, searching and coming to understand what the best version of Himself had to do. It is this moment that continuously reminds me that Jesus ALWAYS fulfilled what His humanly purpose was on this earth. Can you say that you are doing the same? I for sure know I am not, but I have to start somewhere, right? Some small strides, like passing on a cupcake, going to a spin class, or putting a few extra bucks in my 401(k), will get me there someday. Check-in – how are you doing this Lent? Have you successfully abolished or fulfilled your intention(s)? What would the best version of yourself look like? Take 5-10 minutes to write, draw, or somehow illustrate the best version of yourself. Starting today, implement something, anything, that will help you become the best you. Kimberly VanBeek is one of the best humans you will ever meet. She serves as the Development Associate at Cristo Rey Jesuit High School in Milwaukee. She is a Wisconsin lover working to make her corner of the world a better place. A UW-Whitewater graduate and Change A Heart Francisican Volunteer Alum, she enjoys traveling, baking, playing ultimate frisbee, and bringing people together. As many as seven times?" His master summoned him and said to him, 'You wicked servant! unless each of you forgives your brother from your heart." Recently I took on a teaching position at Dominican High School. The students have been great but since they are teenagers there are moments where they act out. One student has had more issues than others. This particular person seems unable to get it together. Some of the offenses have involved copying work from another student, talking back to his teacher and using vulgarity in class. After the last offense these words came out of my mouth: “I am losing my patience with you. You need to pull it together.” Accountability in a high school setting is an important part of discipline and quite frankly this person had earned that reprimand and more but having lost patience with this student stands in contrast to the limitless patience and compassion God has for us. 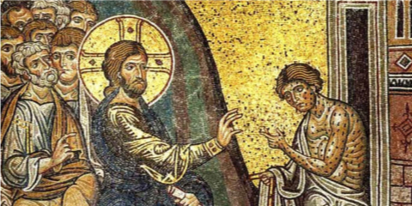 When Peter asks Jesus, how many times must he forgive he believes he is being quite generous in suggesting seven times. In the bible, the number seven represents completeness or perfection. Peter is asking must I forgive those who hurt me perfectly. He probably was expecting a pat on the back for being so magnanimous. Yet as Jesus often does, he pushes Peter further. You are not just to offer forgiveness perfectly, but it is perfection times perfection. The forgiveness we are to offer is complete, full or total. There is not to be an ounce of anger, hurt or resentment left over. It is a forgiveness that has the potential to transform. It is likely that we will be each character in the story sometime in our lives. There will be times where we can be the king and set a person free by forgiving them. Other times we will be the servant who is set free. It is possible that we will be the servant who refuses to forgive. And there may be times we will be the servant who is throttled because of our indiscretion. Sadly, the parable ends with both servants in prison because of an inability to offer compassion and mercy. Even though we have been hurt the power we have to forgive and set someone free is based on the fact that we have been forgiven. Forgiveness is meant to be contagious. Today you are called to spread mercy and forgiveness! I will start with my students. When have you received an undeserved gift of forgiveness? What offenses are most difficult for you to forgive? FAST from a desire for revenge. PRAY for patience with those who annoy you. Joe Nettesheim is the founder and director of 12plus1. He has been involved in Church ministry since 1991. Besides 12plus1 he also teaches part time for Dominican High School and Cardinal Stritch University. He is married to Maribeth. Their blended family consists of 5 children, 2 sons-in-law, 6 grandchildren and TS Eliot, the golden doodle puppy.